Award for North Wales woman leading fight against child slavery | News by Wales Express News, People Before Profit! Pictured presenting the award for Anti Slavery Champion is North Wales Police and Crime Commissioner Arfon Jones with, from left, Deputy Commissioner Ann Griffith, Police Sergeant Zoie Dunkerley and award winner Sian Humphreys. The fact that almost 40 per cent of all reported cases in Wales come from the north which has the highest number of referrals to child welfare charity Barnardo’s Independent Child Trafficking Advocate (ICTA) service of any police region in Wales and is evidence of her success in raising awareness of the problem. 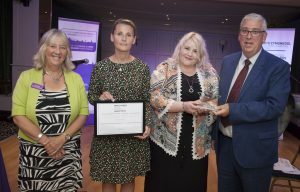 She was presented with the trophy by Commissioner Arfon Jones at a special ceremony at the Celtic Royal Hotel, in Caernarfon, when he paid tribute to the crucial work she carries out working in close partnership with the North Wales Police Modern Slavery Team who are based in St Asaph. “It does exist in Wales and we are seeing this. I have supported children from Pakistan, Albania, Vietnam and Romania to name a few. I also support many British children, who are trafficked within the UK, so to be clear, children can be trafficked from anywhere for any type of exploitation. Out of the four current areas that have an ICTA – Wales, Greater Manchester, Hampshire and the Isle of Wight – Sian has submitted the most referrals, a total of 88 so far this year for children 18 and under. The ICTA adopter sites, Wales, Greater Manchester, Hampshire and the Isle of Wight have all seen a significant amount of referrals and this continues and Sian added: “It’s important to note that modern day slavery and child trafficking is often hidden. “By working with our partners we’re seeing some successful outcomes for children. The number of referrals is positive but this is only a small fraction of the number of children being exploited. A lot of it is hidden and we need the community to be vigilant. “I do a lot of work and training with practitioners who work with vulnerable children to support and upskill. “But we also need to ensure members of the public are aware of the issue. We target places with posters to get people thinking about what is happening in the communities.